Alright, I’ve got your attention. You’re probably thinking “who is this crazy guy that is using the word Love with Windows 8 in the same sentence?” Honestly though, I have not had many problems with Windows 8 and I’ve been happy running it for a long time. I’m actually disappointed that I don’t have Windows 8 at my job, so I can only use it at home. 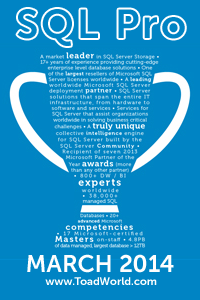 It has been extremely beneficial for me for my SQL Server related work. Why? And why am I stalling to answer your question? And why am I going to change the subject to Hyper-V? If you’re still reading, then great, you’ve got the patience for what is coming next. Windows 8 Pro includes a Hyper Visor in it (Hyper-V to be exact). I’m not talking about software to connect to virtual environments, I’m talking about an actual Hyper Visor that allows you to create and manage virtual machines. Once you enable the option you’re ready to go after a restart, it’s that simple. So what does this have to do with me as a SQL Server Professional? Well, how else are you going to build your own lab environment at home or at work where you can play around, build and break things, and be your own domain admin (warning: power may go to your head on that last one). It’s all part of your life long learning journey and your drive to become a better SQL Server Professional and get the latest and greatest version on your machine to test out without ruining your OS. It so happens that I’m a nice guy, and I’ll show you how to get your environment setup and how to create “templates” for future VMs with this Hyper-V Tricks for the SQL Professional Video I put together. Are you ready to push SQL Server to it’s limits, test things you’ve never tested before, build and break environments without losing your job? If the answer is yes then this video is for you! When you’re done with this video make sure you check out my Virtual SQL Server Lab with Clustering post to enhance your own Virtual playground.